It's several days after the new year now, and my house is all put back together. 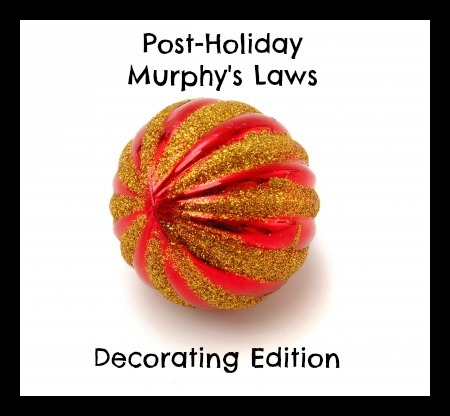 As I was UN-decking my halls of holiday cheer, a few thoughts occurred to me about post Christmas cleanup that surely must be part of some unwritten list of Murphy's Laws for the holidays. 1. The number of happy little "elves" who were beyond excited to help me decorate on Thanksgiving weekend, dropped drastically to zero as everyone pretended to be interested in whatever Bowl game happened to be on t.v. at the exact time I said I would be taking down decorations and would like some help, please. 2. No matter how hard I try, the ornaments are never going to fit back in the boxes the way they came out. So I need to stop trying. 3. The ratio of ornaments I find myself left with is 50:25:25. 50% made it off the tree unbroken and intact. 25% are slightly worse for wear having been chipped or altered in some other manner (I set those aside telling myself I will buy super glue and repair them for next year). 25% were broken, shattered, or ruined completely and thrown away over the course of the holiday. 4. I made a note to myself to stock up on cheap, plastic ornaments at the after Christmas clearance sales as all holiday long my toddler thought it would be a good idea to practice his early ball skills by grabbing ornaments off the tree, running five feet into the kitchen and chucking them onto the tile floor where they became one of the latter 25%. 5. As I put the 50% away that made it through the holidays, I noticed they were all the cheap, ugly ones that I have received as gag gifts or at white elephant holiday parties that I put around the bottom of the tree hoping my toddler would destroy them. 6. I know I am never going fix the 25% I deemed "fixable." 7. Inevitably, I will overlook a decoration that is either winter-themed or was placed in an odd location around my home. Someone will notice it when I am hosting the group playdate in March, after which I will take it down and shove it in the first holiday tote I find. 8. I will wonder where that decoration is next year, only to find it two years from now stuffed among the bunnies and plastic eggs that I use to decorate for Easter. 9. I feel a much bigger sense of satisfaction once the decorations are packed away, the tree is taken to the recycling center, the floor is vacuumed, the furniture is moved back, and the toys are relocated to their permanent locations than I had when I stepped back and viewed the house fully decorated. 10. When the kids are back to school and the house is tidy and quiet again, I will realize that despite the extreme stress, chaos, mess and general disorganization that the holidays bring, I kind of miss it and am looking forward to next Christmas just a little bit.